ham radio equipment to join us. There are several benefits to becoming a member of our organization. Our members pay no dues or carry ID cards. We are a fraternity, young and old, of ham radio operators and short wave listeners who share a common interest in radios of the past. We collect and/or operate those tube-type radios that we love. We are dedicated to restoring and preserving real examples of a wonderful chapter of our ham radio history. It is very simple to join our group all you need do is to check-in or listen to our vintage/classic radio net. In other words, you can activly participate if you are a licensed ham radio operator with a station that will transmit and receive an amplitude modulated signal. 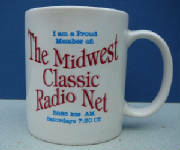 If you are not a ham, or are a short-wave listener (SWL) you might want to listen in to our Saturday morning net.